On 31 March, two Chinese J-11 fighter jets of the People Liberation Army Air Force intentionally crossed the median line of the Taiwan Strait south-west of Penghu, intruding upon a maritime boundary that has been abided by both sides for many years, and as a result damaging the cross-strait status quo. 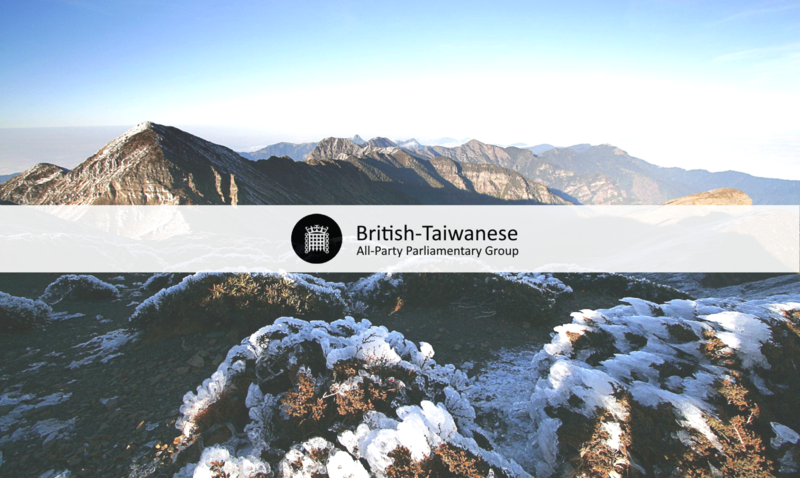 As co-chairs of the British-Taiwanese All Party Parliamentary Group, we are seriously concerned about the rise of tension in cross-strait relations. It is evident that regional peace and stability is at stake. We believe that prosperity and stability across the Taiwan Strait is hugely important to the East Asian region and the world as a whole, and we must stress that maintaining peace in the region is in the common interest of all parties concerned. Any unilateral attempts to disrupt the status quo are harmful and do not contribute to cross-strait stability. Restraint is essential for good relations, and we will continue to support all efforts to defend the cross-strait status quo. To ask the Secretary of State for Health and Social Care, what steps his Department is taking to support Taiwan’s participation in the World Health Assembly as an observer; and whether his Department has encouraged Taiwan to participate in technical meetings of the World Health Organisation. The Department continues to support the Foreign and Commonwealth Office on this topic. The Government is working with likeminded countries to lobby the World Health Organization (WHO) at official level to issue an invitation to Taiwan to observe the World Health Assembly (WHA) in May. The United Kingdom continues to support Taiwan’s meaningful participation in international organisations where statehood is not a prerequisite and where Taiwan can make a valuable contribution. The UK believes the WHA and related technical meetings of the WHO meet these criteria. We are writing to you regarding your recent decision in October to change the designation of Taiwan on your website from ‘Taiwan’ to ‘Taiwan, China’. 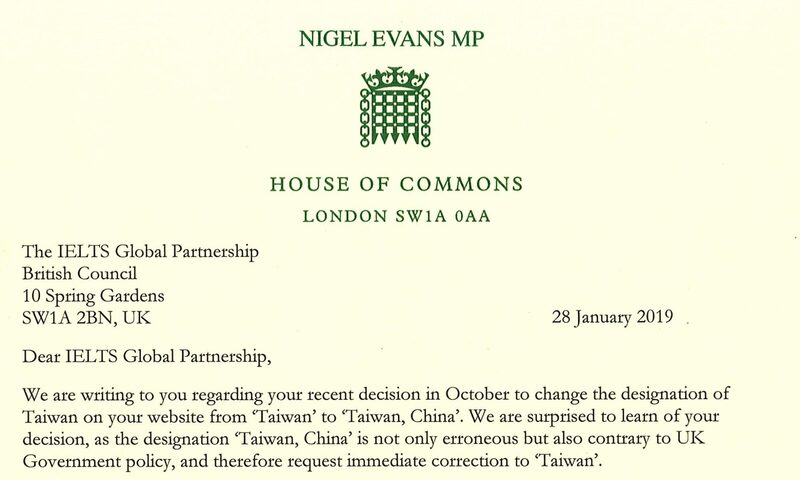 We are surprised to learn of your decision, as the designation ‘Taiwan, China’ is not only erroneous but also contrary to UK Government policy, and therefore request immediate correction to ‘Taiwan’. Your changed designation is inaccurate and misleading as Taiwan has never been a part of the People’s Republic of China. It is also contrary to the UK Government’s longstanding policy to refer to Taiwan as simply ‘Taiwan’, as Mark Field, Minister of State for Asia and the Pacific at the Foreign Commonwealth Office, publicly stated on 10 July. The reason for your decision therefore remains puzzling, as it is neither based on fact nor is it in line with the UK’s official position. The change has resulted in great confusion and protest among Taiwanese people and the IELTS community. Many Taiwanese students and professionals who take the IELTS feel their rights and nationality are being sacrificed. The decision follows pressure from China and is based on commercial interest. Although IELTS is a private enterprise, it should not have the terms of its business dictated by a foreign government. Succumbing to this political pressure undermines our democratic principles and harms the free operations of international business. UK-Taiwanese educational relations are steadily increasing, with approximately 12,000 Taiwanese studying in the UK as of 2017. For many Taiwanese students and professionals, taking the IELTS is an essential stepping stone to study and work in the UK. If IELTS were to change the designation to ‘Taiwan’, it may well allow the UK to continue increasing its educational exchanges with Taiwan. We urge you to reconsider your decision and amend the IELTS website to the previous and proper designation of simply ‘Taiwan’. China’s behaviour towards Taiwan (Bully in Beijing, Times 3rd January 2019) highlights a major threat to principles of self-determination, democracy and human rights that should be resisted firmly by all countries governed by those values. China’s treatment of Tibet, the massacre in Tianneman Square, and its refusal to uphold principles of the Basic Law that was supposed to allow Hong Kong a different system to that of the authoritarian Chinese, all serve to show why Taiwan’s 23 million citizens are right to be more than wary of an enforced ‘re-unification’. China’s behaviour is a threat to peace. In contrast, Taiwan has provided a model as to how a dictatorship can peacefully progress to a multi-party democracy with rival parties respecting the outcome of elections determined by the will of the people. China’s efforts to win friends and influence would be better served by respecting human rights and principles such as freedom of speech at home and abroad. As the co-chairs of the British-Taiwanese All-Party Parliamentary Group, we wholly support Taiwan President Tsai Ing-wen’s firm position to bolster Taiwan as a fully-fledged democracy which shares understanding on universal values such as freedom, respect for human rights, and the rule of law with the UK and countries around the world. We also understand that the vast majority of people in Taiwan form a consensus that resolutely opposes “one country, two systems”. We regard any threat or intimidation in the Taiwan Strait as irresponsible, and want to ensure that action taken in the Taiwan Strait does not threaten cross-strait relations and status quo. Maintaining prosperity and stability in the East Asian region is in the common interest of all parties concerned, we therefore wish to see China and Taiwan cooperate fully on areas of common interest, while respecting the firm commitment of Taiwan’s 23 million people to freedom and democracy. In the future, we look forward to China and Taiwan working together to ensure respect on both sides, particularly in the ability for both countries to have their voices heard in international fora such as the World Health Organization and the International Civil Aviation Organization. Therefore, we call on China and Taiwan to restore dialogue and consultations with each other on the basis of mutual respect in order to ensure regional peace and stability. As the Co-Chairs of the British-Taiwanese All-Party Parliamentary Group, we have for many years supported Taiwan’s meaningful participation in international organisations where Taiwan can make concrete contributions, including INTERPOL. Therefore, we were dismayed to learn that Taiwan has yet to be invited to participate in the upcoming 87th INTERPOL General Assembly in Dubai as an observer due to unnecessary political considerations. We believe this will in turn obstruct the collective interests of the international community. According to Article 2 of INTERPOL’s Constitution, INTERPOL’s aims are ‘to ensure and promote the widest possible mutual assistance between all criminal police authorities…’ Transnational crime is rampant in today’s globalized world, thus we must establish a reliable and seamless global security network. To this end, the cooperation of police agencies from all over the world is needed, and Taiwan’s presence is essential to the realization of this objective. With a population of 23.5 million people, Taiwan is the world’s 22nd-largest economy and 17th-largest exporting country. Connecting Northeast and Southeast Asia, Taiwan serves as a hub for the movement of capital, goods, and people, with around 66 million passengers traveling through it in 2017 alone. Taiwan’s ability in sharing international security intelligence and combatting cross-border crime would contribute to the global security and counter terrorism efforts. At the same time, Taiwan needs to participate in INTERPOL General Assembly and gain direct access to the I-24/7 Global Police Communications System to ensure it has the ability and up-to-date knowledge to implement security checks at its borders and fight terrorism, human trafficking, and other transnational crimes. We support Taiwan’s meaningful participation in INTERPOL, including in its General Assembly as an observer and in its meetings, mechanisms, and activities. We also support Taiwan to gain access to the I-24/7 Global Police Communications System and partake in key training programs, in order to fill the gap in the global security network and create together a safer world. As the co-chairs of the British-Taiwanese All-Party Parliamentary Group, we are dismayed to learn that members of East Asian Olympic Committee (EAOC) voted in an extraordinary Council meeting in Beijing on 24 July to revoke the right of Taichung City to host the first-ever East Asian Youth Games (EAYG) in Taiwan from 24 to 31 August in 2019. This resolution not only ignores the rights of the 2,300 athletes and delegation members from the nine countries and regions in East Asia, but also violates the Olympic spirit that athletes from countries and regions around the world should conduct exchanges through fair competition. It also violates the EAOC’s Constitution, which stipulated “to promote the Olympic Movement in East Asia” as its mission. Moreover, the Taichung City Government has always honoured the Host City Contract and not been informed of any failures to fulfil any of its contractual obligations over the past three years. Also, the EAOC never mentioned what terms were allegedly violated in the letter sent to the Taichung City Government on 25 July. The world of sports has no borders, and athletic exchanges are the ideal venue to help different countries and peoples get to know each other and promote international harmony. Since being awarded the hosting right in 2014, the Taichung City Government has been preparing for the EAYG. With the date of the competition approaching, China’s boycott to pressure the EAOC into passing a resolution to cancel the Games is hasty and extremely unfair to the host city. For many years China’s government has repeatedly used every means at its disposal to limit Taiwan’s space for international participation. From the recent case of pressuring international airlines to change Taiwan’s designation to this unfair resolution made by the EAOC, it is obvious that China’s politically motivated pressure has expanded to non-political areas. Thus, in order to protect the rights of athletes as well as safeguard the Olympic spirit, there is a need for EAOC Council to resolve this dispute with Taiwan through amicable consultation and resume the hosting right of Taichung City as soon as possible. As the co-chairs of the British-Taiwanese All-Party Parliamentary Group, we are dismayed to learn that China’s civil aviation authority unilaterally announced on 4 January 2018 that it would activate four air routes along its southeast coast without prior consultation with Taiwan. The new northbound M503 route with its three east-west extension routes, which are critically close to the median line of the Taiwan Strait, are very likely to endanger aviation safety and security and to interfere with flight services in Taipei Flight Information Region (FIR). We regarded the unilateral move by China as an irresponsible act that not only seriously affects aviation safety but also damages the cross-strait status quo. Beijing’s expansion of civil aviation routes has violated the consensus reached between Taiwan and China in 2015. Thus, we consider this violation in a way to change the cross-strait status quo. Moreover, there is possibility that a potential risk of military crisis could emerge in the Taiwan Strait, constituting a threat to the peace and security of the East Asia region. According to Document No. 9426 of International Civil Aviation Organization (ICAO), flight routes such as M503 and its extensions should only be launched following consultations with neighboring parties. Thus, China’s unilateral launch of new flight routes violates both ICAO regulations and international norms. As ensuring aviation safety and maintaining peace and stability in the region remain the common concern of all parties concerned, we support the maintenance of the status quo in the Taiwan Strait and urge China to put an end immediately to its use of the above-mentioned air routes. There is a need for China to give priority to restoring negotiations with Taiwan on the flight paths as soon as possible.